As I stay in Shanghai on my 6th day I am staring to get Internet withdraws. It is not that I do not have access to the Internet. I do have access to my online store, my emails, my blog and some of my favorite sites. Although this is possible the mainland Chinese government has effectively killed my net social life. Access to Facebook, Twitter and all Google feeds for blogs are blocked. For the latter I have to figure out the original site, visit it's Home page and then locate the story I'm interested in. Yes, VPN is one way to get around the Great Firewall, but I am not that addicted to my net social life to pay for VPN service during my short stay in Shanghai, and the free services like Hotspot Shield is not helping. For Twitter I use it more for sharing interesting finds on The Net and breaking technology related news. I hope my followers will not give up on me during my short period of hiatus. I guess I can only tell when I returns to Hong Kong. I had always been a proponent for the use of OAuth, but another side effect from these Internet restrictions is my reliance on OAuth. Three of the providers I use are: Google, Twitter and Facebook, all except for the Google is totally blocked by China Information Bureau (CIB). In future OAuth and particularly XAuth implementations we should take this into consider. Aside from these restricted accesses I'm also not use to having to first locate WiFi hotspots whenever I want to use the net connection on my iPhone. I had decided to give that up a year ago when I signed up for my first unlimited 3G network access with Smartone-Vodafone (SMV). Unfortunately SMV does not offer a roaming data plan while travelling, so turning my 3G data access on while in Shanghai will be costly. Being always connected to the Internet is not only for the benefit of my net social life. It is also important for me to keep an eye on the emails relating to my online store, locate where I am in a foreign city, and find transit information. Fortunately, for the latter I had the foresight to purchase the USD0.99 iPhone app Explore Shanghai [iTunes link] before I left HK. This little app made me appear to be an experienced Shanghai subway user. Last night this app was updated to include the new subway (Metro) line (#13), just in time for the opening (May 1st) of World Expo 2010. I understand China government's needs to control information dissemination. It is the one of the major way for a communist government to keep control of the country. Although the influx of foreigners in a cosmopolitan city like Shanghai; especially during a world event like The Expo, outside information and opinions will inevitably reach locals even with the heavy control of the CIB. I hope the publishing of this post will not get my blog block within China as that is definitely not my intentions. I think that every government system in the world has its benefits and we cannot impose our own believes onto other countries. All I am pointing out with this post is that we are no longer living in an information deprived world, although information may not be readily available in certain part of the world, it will eventual arrive to those who seek it. Forcefully prevent the flow of information may not be the most effective way to control its flow. Just read the article, When Do They Need a Fig Leaf?, on New York Times. This brought up an issue that I see fairly frequently. That is the presence of kids of opposite gender in washrooms. The article asks at what age should kids be prevented from running around in public or private home naked? Should children ever allowed to be running around naked? I think these are questions that have different answers depending on your cultural up bringing and the social acceptance of the city/country where you live. In the case of public washroom I think any children older than 5 should not be allow to go into washroom of opposite gender. It is unfortunate, but our society has too many weirdos and bad people to allow our children to maintain their innocence. Don't get me wrong, I am all for children maintaining their innocence as long as possible. I think we should teach our next generation to respect our body and others, educate them on the differences of their body as early as possible, and the appropriateness of when they can be naked. What do you think? Love to hear your comments below, on Twitter, Facebook or FriendFeed. Jarrett Rush of The Dallas Morning News posted the short post in the Opinion Blog of the newspaper web site titled, Should AT&T be allowed to be the iPhone's exclusive carrier?. This sparked 65 comments on the newspaper web site, several hours ago it made it to the front page on Digg, which collected 191 more comments; as of this writing. The last comment on Digg being mine, which I had copied here as I did not have enough time to edit my original comment. I think AT&T or any carriers should not have an exclusive on hardware. Yes, if we do not have exclusivity, mobile handset prices will go up, but I think the market will take care of that. We in Hong Kong had enjoy this free market for years. Mobile phone handsets are not locked to any particular carrier. GMS became the only network platform 9 years ago, and the last of the CDMA network was phased out by with the last carrier 8 years ago. A study showed that there is an average of 3 mobile phone per person in Hong Kong, and most of the major manufactures launch their newest handsets in Hong Kong first as test market. Some times even before they launch the handset in their home country. Mobile phones are prevalent, everyone in Hong Kong has one, from age 12 and above. The only ones you see using pay phones on the streets are tourists. As a result of this free market we also enjoy SIM unlocked mobile phones for years. With every features of the mobile phone as designed by the manufacture available to the consumers. Most of the mobile carriers offer contracts for their tariff plans but most also have monthly pay-as-you-go packages. There should be a freedom of choice for the consumers. Each consumer should have the choice to purchase the least expensive to the most expensive handsets. This choice should be based on the consumer's budget and desired features. None of this should be determined by the mobile carriers. I just saw the following tweet in my Twitter stream. For those of you who does not know SCMP stands for "South China Morning Post" the only major English newspaper left in Hong Kong. Does SCMP realize they are a news agency. If there is a story about police in China arresting people carrying GPS devices as spy, then we want to know about it now, today. We don't need a preview of "story to come tomorrow" so you can hope to sell more newspaper tomorrow. What is Apple doing? They released a new generation iPod Shuffle tonight (morning US PST) that is ultimate in minimalist. Like the 2nd generation iPod Shuffle it had no display, which when the 2G was released back in September 2006, people thought Apple was crazy to release a MP3 player without a display. So much so, that the imitators (in China) created versions of the iPod Shuffle (2G) look-a-like that had a display and radio tuners. Now with the 3rd generation iPod Shuffle Apple went further to remove over 50% of the controls from the previous model and achieve to deliver the rest of the controls with just one (3-way) switch. Of course, Apple did not do this minimalistic approach hastily, they replaced the removed 50% controls with a multi-positions switch on the headphone. This is the same headphone that was shipped with the iPod Touch (2G). To satisfy the critics who complain that the original iPod Shuffle did not have a display, Apple included voice over in the new Shuffle to announce the details of the currently playing track and playlists. A flaw I see with this latest minimalist design, is for people who do not want to use Apple's headphones, they will have lost the ability to control the skipping, pause and play of the shuffle. Apple could have solve this by sliding the headphone control down the headphone cord and then made the cord a two pieces detectable. With one piece housing the pair of headphone and the other piece becomes an extension cord with the single switch control. So users with 3rd party headphone can easily plug their own headphone into Apple's extension cord with the control switch. Of course, this is not my original design, many manufactures (ie. Sony, LG, etc.) have this design. Aside from a minimalist design of the new iPod, did Apple marketing also adopted a new approach? There was no fan fare to announce the new iPod, nor did they make any rumble when they released the new Mac Mini, iMac and Mac Pro last week. They also did the release on a Wednesday (US PST time) rather than the normal Tuesday release date. Is this the new Apple, or is it just while Steve Jobs is absence? How many more product announcement are we to expect before Jobs' return? Given that almost all the hardware had been upgraded, they are only left with Apple applications and OS X, that latter which everyone have been expecting at this year's WWDC. This evening (20:52) my girlfriend received a call on her mobile from PCCW Netvigator telephone salesperson. Like in most cases when one receive this sort of unsolicited telephone call, she simply told the salesperson on the phone that she does not have time to talk, which was the case this evening, as she was at a friend's house. Instead of giving up and move on to the next "victim" on their call list, the salesperson calls her back and said, "... I was not calling to give you an offer, but if I was I would not offer it to you. ", then hung up. First of all these sorts of calls are unsolicited and I would consider them to be SPAM calls. I will be writing to OFTA to file a formal complaint of PCCW Netvigator salesperson's attitudes. Of course, PCCW's salespersons are already famous in Hong Kong for having one of the worst customer facing attitudes so that is not too surprising. I wish OFTA would have an ordinance like the Unsolicited Electronic Messages Ordinance for regular telephone calls. This evening at one of the busiest location in Causeway Bay, Hong Kong, near Time Square at 21:00 in the evening. Where normally it's very difficult to find an empty taxi, had so many available taxis that the line up spilled out onto a street three blocks away. Could this be the result of the recent taxi rate hike before Christmas? 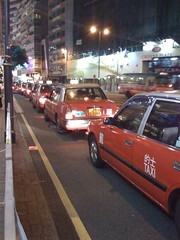 I really don't understand why the taxi industry of Hong Kong chooses to raise the rates during this worldwide economic down spin, where Hong Kong is one of the many cities taking the brunt of the effects. With many people in Hong Kong worry about the security of their jobs in the coming months. The taxis industry's original excuse for raising the rates was the high cost of gas prices, therefore raising their cost of operation. 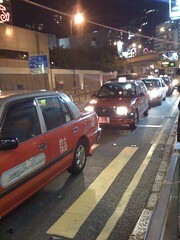 This did not make sense to me, as 100% of the taxis in Hong Kong are fueled by LPG. Plus gas prices had dropped over HKD4.00/L since their original complaint. Apple announced in a PR that the coming Macworld 2009, held in San Francisco will be the last time Apple is attending MacWorld. Is this announcement that significant? With the buzz generated with this Apple PR, the Interweb has been buzzing all morning and through out the day with new articles speculating what this all means. With some even brought up conspiracy theories. CNet: Without Macworld, how will Apple create the buzz? To me this is an inevitable decision that is long over due by Apple and other large corporates. Apple had long omitted their attendance at CES, and earlier Adobe announce that they will not be attending Macworld 2009. Large conferences like CES and Macworld are not suitable venue for them to show off their products, these sort of show are more suitable for SME and startups. Unfortunately, without the large corporates, consumers may not attend these shows. If the attendees do not show up the organizer will eventually have to shut the show down, the ones who will suffer the most are the startups and SME who relies on the traffics to these conferences to get their word out. For them I say they need to rethink their marketing strategies. With this PR announcement, Apple has in effect drove in the last nail to the Macworld coffin. When Apple pulled out of the [US] East coast Macworld conference, the organizer had to eventually stop holding a conference on the East coast. This latest development should shut down Macworld once and for all after the San Francisco show in three weeks. Unless the organizer comes up with original tactics to keep the attendees and exhibitioners. For the average consumers (Macintosh and Apple products users), I think the lack of a Macworld is a great lost. Although, Macworld is serving only "average" consumers in the San Francisco area, as there are not too many "average" (non-press, non-tech industry) users who flies to San Francisco just to attend Macworld; admittedly I did one year. Most of all Macworld also serves as an annual celebration for these consumers for choosing the Macintosh platform and Apple products in general.